Online Deal - 50% Off! There is no better way to save than to get 50% off your tickets. NO promo code needed to receive discount. Get your tickets starting at $25 before taxes and fees. 50% Off tickets are available for purchase only online. 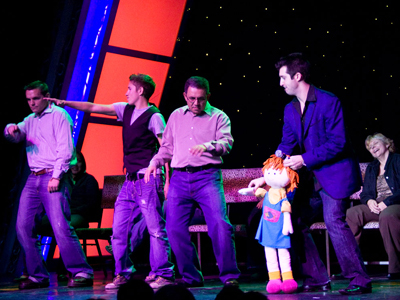 Although his name is on the marquee for this hilarious show, Marc Savard puts the volunteers that he hypnotizes in the front and center of the entertainment by making them perform zany actions in front of a supportive crowd at his Comedy Hypnosis show inside of the V Theater at Planet Hollywood. You can See the show or Be the show! Marc Savard Comedy Hypnosis is a raucous show that features audience volunteers performing crazy and sometimes embarrassing actions in front of complete strangers under the influence of hypnosis. Marc Savard uses his talents to propel the action, but takes a back seat to allow the antics of his “subjects” to provide for the evening’s entertainment. Audience members get to be involved with the hilarity by helping to suggest commands given to the onstage volunteers as the action unfolds. Savard begins each show with an explanation of what makes for a good candidate to be hypnotized – most importantly he requests that you have a fun and outgoing personality. Chairs are set up onstage for volunteers to take their place, at which point Savard performs exercises to lull them into subconscious submission. Once they are teetering on their seats with eyes closed, the real mayhem begins. He begins with group exercises asking his new cast to awake and perform as musicians in an orchestra. With this routine, the audience gets a taste of what’s in store and Savard can then choose his final selections to perform the deeper stages of hypnosis upon. 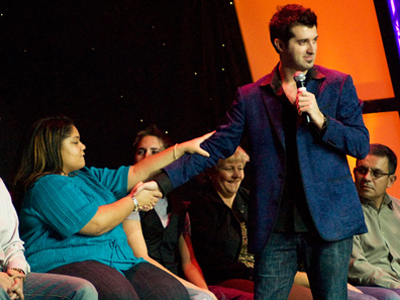 Marc Savard Comedy Hypnosis is an adult-oriented show and pushes volunteers into wild and embarrassing scenarios in front of a live audience that propels the action onstage. You won’t be able to control your laughter from the zany exhibitions that Savard is able to convince people to display under his hypnotic control. This was such a hilarious show to see, but leave the kids at home. I really couldn’t stop laughing and the price was well worth the laughs. This show was fun to watch. There is some adult content throughout. The comedy kept my husband and I laughing. For the money we spent, this show was worth it. This man is Truly Amazing! He is by far the funniest person I have ever seen! I was beyond impressed and wish the show lasted longer! He is very indecent with his act but I loved every single solitary second of it! I WANT MORE!!!!!! LOVE LOVE LOVE!!! There arent too many shows in Vegas that you can see for under 20! This show was funny at times. For the money we spent, it was worth seeing.